NASA’s global warming evidence page filled with lies, half truths and suspect data. This is the problem when you have an administration that hires the most dedicated radicals and is willing to politicize most everything. So much for NASA’s primary mission of space exploration says former NASA administrator Micheal Griffin who calls the change in priorities “deeply flawed“. The ice core data never has shown CO2 levels above 284.7 over the last 70,000 years (see official Vostok Ice Core Data below) so where in the world did they get this graph and how was it generated? First I started with the linked reference to NOAA, yes the same outfit that gets its recent data from James Hansen who stated that energy industry CEO’s should be put on trial for crimes against humanity, the same NOAA/NASA/ Goddard that has been caught manufacturing data and prefers data from ground station sensors that have been found on black top parking lots (don’t walk on it barefoot on a sunny day), next to building heat vents, at the beginning on runways so that jet engine jet wash hits them, placed on rocky like gravel, in refuge dumps, and all sorts of other places that serve to drive the measurements up. So as I was saying, I examined the NOAA link and it brings you to this intimidating looking page filled with a long list of links to data sets. Seems pretty convincing right? Until I started examining the data on the page. The first thing I noticed is that no where on the page does it explain how these data sets were put together to generate this graph. So much for transparency. The second thing I noticed is that many of the links do not go to CO2 data sets at all many of them go to methane data sets like this one and ionized oxygen data sets like this one. This graph, based on the comparison of atmospheric samples contained in ice cores and more recent direct measurements, provides evidence that atmospheric CO2 has increased since the Industrial Revolution. The final “hockey stick” shaped part of this graph I have seen before, but to make sure I wasn’t missing something I started looking for this image on the web sites of “noted” proponents of global warming alarmism. So I started doing some Google image searching and I found it. I should not have been surprised when I discovered that famed global warming alarmism debunker Anthony Watts had already outed one of the chief suspects using this bogus graph. University Distinguished Professor in the Department of Geosciences and Director of the Climate System Research Center (http://www.paleoclimate.org). The hockey stick graph is a result of the now infamous computer model made by Dr. Michael Mann (of ClimateGate fame) and Dr. Bradley that generated this hockey stick no matter what numbers were entered into the model. The model could not generate known measurements when genuine data form the past was entered into it. Mann and Bradley tried to hide the raw data so that no one could verify their claims until they were forced to hand the data for the “hockey stick” over. The answer is seems, is that there is no new data from the Vostok Ice core. It ended, and the official repositories of that data have no new data. The last CO2 value for the Vostok Ice Core dataset is listed as being 284.7ppm. Aside from the bogus aforementioned ‘hockey stick’ method of graphing, there is only one raw data set that shows numbers that appear in the NASA graph and the Bradley picture. That dataset is from the weather station atop Mauna Loa Volcano in Hawaii. data is controversial because it always shows the very highest amount of CO2 in the atmosphere of any data set. Why? First, it sits atop an active volcano that constantly spews CO2. Second, Hawaii is a small land mass that sits in a very hot part of the world which is surrounded by the ocean. The warmer it gets the more the ocean releases its CO2 (think of the ocean like a giant CO2 sponge.) Not exactly the most objective choice to measure “global” CO2 to be sure. Well well well, we have found our dataset and it is NOT from Vostok Ice Cores or any other ice core; nor is it just a direct CO2 reading from Vostok. 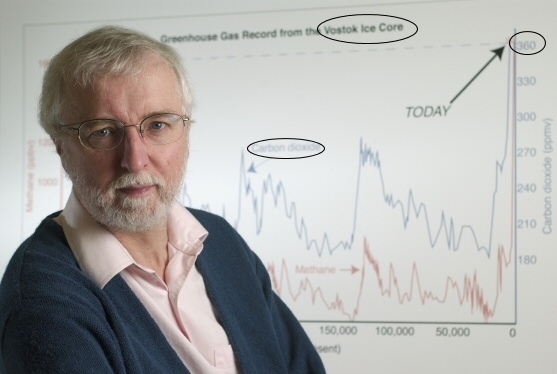 Dr. Bradley, obviously using the same academic integrity he displayed in his “hockey stick’ sham, pasted the Mauna Loa data onto the Vostok Ice Core data to make one impressive looking graph. He of course just didn’t believe it was necessary to reveal that little detail. I examined the properties of Dr. Bradley’s photo and it was last modified on Tuesday, January 20, 2009 2:51:19 PM also known as Barack Obama’s inauguration day. Was someone trying to get attention for a grant or a job? This data is also certainly not “a comparison of more direct measurements” as the NASA graph states or an average of the data given as the NOAA source link. It is the pasting of the raw numbers from the most elevated dataset they could find onto the Vostok Ice Core dataset, and presented as if it was some kind of “average”. Now here’s the problem. If you took surface temperature data [or CO2 data for that matter] from Antarctica, and spliced it with surface temperature data from Hawaii, and then presented it as the entire historical record from Antarctica, our friends would have a veritable “cow”. Or, if you took stock performance data from poorly performing Company “A” and spliced on better performing stock data from Company “B”, and then made a new graph and used that graph to sell investors on Company “A”, the Securities and Exchange Commission (SEC) would have a veritable “cow” when they found out, wouldn’t they? People go to jail for such things. But hey, this is Climate Science. Remember how we told you to keep in mind the comment from the NASA graph about the Industrial Revolution? Keep in mind that CO2 is but one of the smallest players in global temps and global temps do not always follow CO2 levels. The sun has a much larger impact than man made CO2 and global temps often, but do not always follow solar output cycles. This shows that there are many factors that affect global temperatures. Examine the graph [above] carefully. It shows that most of the warming that has happened in the last 200 years occurred before 1940; well before most industrialization and before most people had used cars. 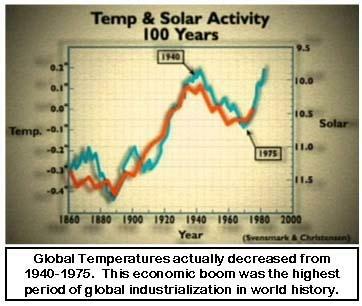 It shows that global temperatures actually decreased from 1940 to 1975, which is the time of the post war economic boom, the highest period of global industrialization in world history. According to the theory of man made global warming the temperatures should not have gone up much before 1940 and should have went up quickly after 1940. Exactly the opposite is what took place. What about the rest of what is on that NASA page? While I do not have the data to refute all of the points listed, I do have the data to refute, or at least very credibly challenge, several data points they have listed.To see a long list of IPCC retractions go HERE, HERE, and HERE. This is a typical example of relatively accurate information delivered with an “attitude” to imply a coming catastrophe. Look at the temperature chart above. The global temps did indeed rise several tenths of a degree before 1940 which shows why measurement over a century would show a sea level rise. Then for 35 years the Globe cooled during the massive CO2 output of the post war industrial boom. Then global temps rose quickly from 1976 to 1998 which would result in a rapid warming and expansion of the ocean just NASA says which makes sense given the date of their data set, but since most of this happened before the post war industrial boom how is this mans fault? IPCC is already retracting doom and gloom claims of massive sea level rises. Study claimed in 2009 that sea levels would rise by up to 82cm by the end of century – but the report’s author now says true estimate is still unknown. Senior members of the UN’s climate science body admit a claim that Himalayan glaciers could melt away by 2035 was unfounded. The UN’s climate science body has admitted that a claim made in its 2007 report – that Himalayan glaciers could melt away by 2035 – was unfounded. The admission today followed a New Scientist article last week that revealed the source of the claim made in the 2007 report by the Intergovernmental Panel on Climate Change (IPCC) was not peer-reviewed scientific literature – but a media interview with a scientist conducted in 1999. Several senior scientists have now said the claim was unrealistic and that the large Himalayan glaciers could not melt in a few decades. They are correct that the Earth warmed much since 1880 before the post war industrial boom. But they left out the cooling form 1940 to 1975 as shown in the chart above. The claim that most of the warming happened after 1970 is disputed to the point where I feel safe saying that the claim is demonstrably false. The claim that the surface temps continue to rise from 2007 to 2009 is from those NASA/NOAA/Goddard ground stations we told you about above. The other source for this is the discredited CRU which was the epicenter of the ClimateGate data manipulation and destruction of raw data. There are satellite datasets that dispute the 2007-2009 claim. Phil Jones, the University of East Anglia (CRU) climate scientist at the centre of the Climategate scandal, concedes to the BBC we’ve had warming bursts just like the last one that the IPCC claims was probably man-made. Jones also admitted there has been no statistical significant warming since 1995. Herald Sun of Australia 15 Feb 2010 (another link HERE). Phil Jones is saying there is a warming trend but it’s not statistically significant. [Hello isn’t that what we just said – Editor] He’s not talking about whether warming is actually happening. He’s discussing our ability to detect that warming trend in a noisy signal over a short period. To demonstrate this, look at the HadCRUT temperature record from 1995 to 2009. The linear trend is that of warming. However, the temperature record is very noisy with lots of short term variability. The noisy signal means that over a short period, the uncertainty of the warming trend is almost as large as the actual trend. This makes my point exactly, when the “noise” and the “trend” are within the margin of error and amount to tiny variations (CRU of ClimateGate fame has already shown that they are desperate to steer temperature data upwards anyways) there is a term for this, its called flat-lining. There is noise and variation within the margin of error that is not statistically significant. Maybe one day that will change, but is this the data that we want to completely reform our economy on and turn it over to far left central planners in the government? This is from the same guys that tried to make the entire world believe was catastrophic by manipulating the data and the peer review process to scare the hell out of people. The UK Hadley Center which (is global warming alarmist) published a dataset with the University of Alabama showing global cooling since 2002 HERE. This graph shows average global temperature records for the last five [to 6.5 years] years from two of the world’s most respected meteorological institutes, the UK’s Hadley Centre, and the University of Alabama in the US. Both show a clear downward trend, and the graph contrasts that trend explicitly with the rising trend of atmospheric CO2. NCDC now has December 2008 in the database. Annual North American temperature since 1998 (11 years of data) is falling over the period at a rate of 0.78(F)/decade or 7.8(F)per century. At this rate we will be in an ice age within 5 decades. If you can get the graphic, the heavy black line is the average over the century 1901 to 2000. There was so much cooling that the UK Telegraph published a column declaring 2008 to be the year that mane made global warming was disproved complete with a load of good links. So much for the old “All scientists agree” and “total scientific consensus”. But IPCC lead author Mojib Latif just told us in the video above that changes in the North Atlantic Oscillation and studies in changes of ocean temps would result in 30 years of cooling or a mini ice age [perhaps like Europe had a few hundred years ago]. The Greenland and Antarctic ice sheets have decreased in mass. Data from NASA’s Gravity Recovery and Climate Experiment show Greenland lost 150 to 250 cubic kilometers (36 to 60 cubic miles) of ice per year between 2002 and 2006, while Antarctica lost about 152 cubic kilometers (36 cubic miles) of ice between 2002 and 2005. Sounds ominous, luckily we have the University of British Columbia to make us all feel better as they went and ruined the alarmists day by publishing a study in Nature telling us about that Greenland ice sheet melt: “it’s weather, not climate”. While there are some data sets that say Antarctic sea ice is shrinking, other data sets say quite the opposite. The CATO Institute quotes the IPCC which states that they expect Antarctic ice to grow in the 21st century and they also quote Nature in 2003 showing cooling and January 2008 Geophysical Research Letters expressing doubts. A difference of: 1,576,563 square kilometers, now in fairness, 2008 was a leap year, so to avoid that criticism, the value of 6,857,188 square kilometers can be used which is the 10/13/08 value, for a difference of 1,369,532 sq km. Still not too shabby at 24.9 %. The one day gain between 10/13/08 and 10/14/08 of 3.8% is also quite impressive. Watch the red line as it progresses. So far we are back to above 2005 levels, and 28.7% (or 24.9% depending on how you want to look at it) ahead of last year at this time. That’s quite a jump, basically a 3x gain, since the minimum of 9% over 2007 set on September 16th. Read about that here. There is no mention of this on the National Snow and Ice Data Center sea ice news webpage, which has been trumpeting every loss and low for the past two years…not a peep. You’d think this would be big news. Perhaps the embarrassment of not having an ice free north pole in 2008, which was sparked by press comments made by Dr. Mark Serreze there and speculation on their own website, has made them unresponsive in this case. What I like about the IARC-JAXA website is that they simply report the data, they don’t try to interpret it, editorialize it, or make press releases on it. They just present the data. November 22, 2010 AccuWeather Sea Ice Report – Northern Sea Ice still coming back – Southern Sea Ice on long increasing trend. All of the charts are posted on the Sea Ice Page for all to see. Northern Sea Ice went on the downward curve on its cycle with the bottom coming in 2007. Now the ice trend is curving back up just as cycles do. NOAA Claim: Warmest June Ever – But They Made Up Much of the Data! This entry was posted on December 10, 2010 at 02:31	and is filed under 2012, Alarmism, Campus Freedom, Indoctrination & Censorship, Chuck Norton, Obama and Congress Post Inaugration. You can follow any responses to this entry through the RSS 2.0 feed. You can leave a response, or trackback from your own site. I have reviewed this site and it is packed with absurdly mis-leading information, the authors ought to be ashamed of spreading this crap around. Most imprtantly, the measure of ~370ppmv atmosphereic concentration doesn’t come from the ice core data, you dummies. That figure is a real, factual, concrete measurement of the current CO2 concentrations taken from the weather observatory of Mauna Loa Hawaii, and this data is accepted as the most accurate co2 measurements available in the world. Ice cores show that CO2 has never been that high in at least the past 400,000 years, and that is alarming to someone who understands the science. The authors of this website should have discovered this immediately if they honestly attempted to review the science, but instead they take readers on a shameful goosechase through their own political opinions. Ridiculous. You need to reread the post more carefully. Ummmm first of all what you say here is what I said in my post, but then you omit key facts… oh what a surprise … hey man with tactics like that you would make a great climate scientist and might even get a grant from Goldman Sachs or the climate exchange people. Go back, reread it, try to read for comprehension, try to understand what is being explained to you and get back to me. If Mauna Loa is the “most accurate” than why is the CO2 ppm count from other sources of data from other places not congruent with Mauna Loa? Also if you wanted to show PPM that was more congruent how about you take freshly packed snow and ice from Vostok and compare that with the ice core data – or here is a crazy idea – take some direct CO2 PPM measurements from Vostok instead of going to Mauna Loa so that way it is closer to an apples to apples comparison? What NASA did with the graph is the same thing that Dr. Bradley did. In essence if CO2 were temperature you take the temps from the north pole and then tag on temps from Hawaii and say “see look at how fast global temps went up”. If you want to have a graph that shows an average of data sets then have one, you don’t take the data from 400,000 years using one method and then tag on a single data set that almost always gives the highest number and mislead by presenting it like it is some kind of average. If I had dared to pull a stunt like that in the physics classes I took I would have been cited for academic misconduct, which is exactly what Bradley and the NASA graph does. We must also keep in mind that proxy methods of getting CO2 and temperature data do not always match real measurements one must be very mindful and clear about when you mix the two together. We know now from the disgraced climate-gate scientific data that escaped destruction form their cover up that proxy data and real measurements from the same years show that the proxy data is either lower than the real measurement or the assumptions put into the models for the proxy data were steered down (thus making a hockey stick with direct measured data and walla mom its a hockey stick). This post is filled with links and data sets that you can follow and verify for yourself. Could you please try to demonstrate that a single one of the datasets and/or sources linked to are not genuine? Of course you can’t. By the way, Mauna Loa is not accepted by everyone as the most accurate CO2 data for the reasons I stated in the post. It is “the most accurate” for those who are getting big fat grants to push global warming alarmism, those who treat the issue as if it is some sort of religion, and far left ideologues who want to make the issue into a crisis so they can use the Hegelian Dialectic to further their power. The ocean is a CO2 sponge and the warmer it gets the more CO2 it releases, AND the volcano there is active and spews CO2 constantly. So you pick the spot of an active volcano on a blip of land in one of the warmest spots on the ocean and dare to present that as if it is normal…. and you dare to call ME a dummy. You have shown that you are great at half truth arguments, straw man arguments and name calling. Too bad you are way short of substantive refutation. You are way out of your league. The comment above is from John Stallman, who works for the government and takes people on hikes at the said volcano and as such he has a vested interest in promoting it. Thanks for not having the courage to state your vested interest up front. We both know what would happen to you if you posted publicly anything other than the alarmist narrative. Greenland Ice Core Data shows average of 330-350 CO2 PPM – Fossilized plant stoma record shows pre industrial CO2 PPM to be 360-390 CO2 PPM. GEOCARB shows that ice cores underestimate the long-term average Pleistocene CO2 level by 36ppmv. CO2 levels from the Early Holocene through pre-industrial times were highly variable and not stable as the Antarctic ice cores suggest. The carbon and climate cycles are coupled in a consistent manner from the Early Holocene to the present day. The carbon cycle lags behind the climate cycle and thus does not drive the climate cycle. 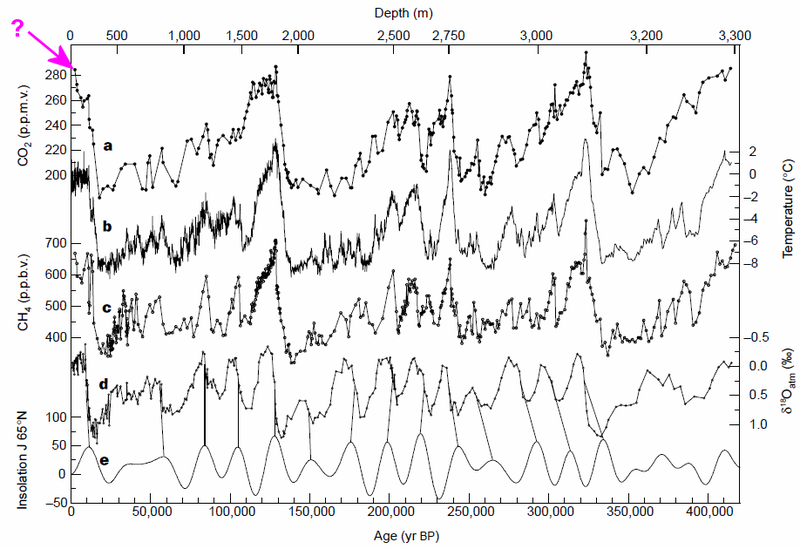 The lag time is consistent with the hypothesis of a temperature-driven carbon cycle. The anthropogenic contribution to the carbon cycle since 1860 is minimal and inconsequential. It’s starting to look like NASA is up to its eyeballs in this! They would do well and come out and publicly disown the HOAXERS in it’s own ranks. While it will not overcome the 20 plus years they let (without proper oversight or worse in bed with) the crooks disparaging their name it will blunt the growing disbelief in their previous awesome accomplishments. Since it looks like America will not be able to fund anything awesome again in this generations lifetime they need to preserve what they already have done. P.S. Having lost the original moon landing tapes didn’t help much with the growing trust problem they’ve got either. Come on NASA do the right thing!